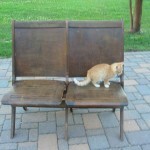 A Chair by Any Other Name….is a Scripture Art Chair! 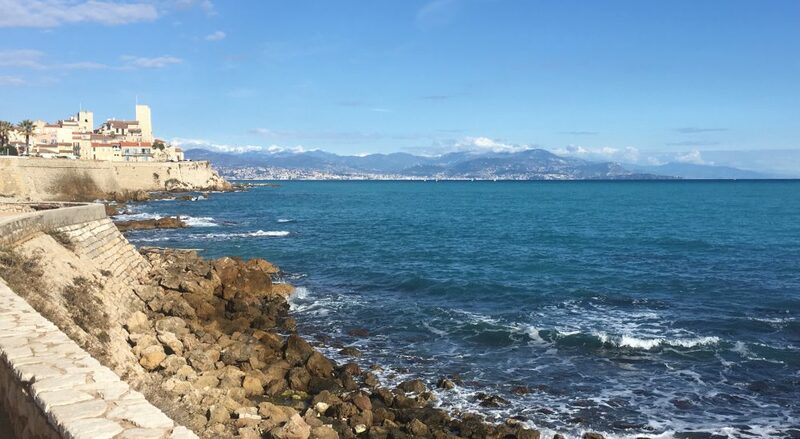 | C'est La Vie -This is Life! 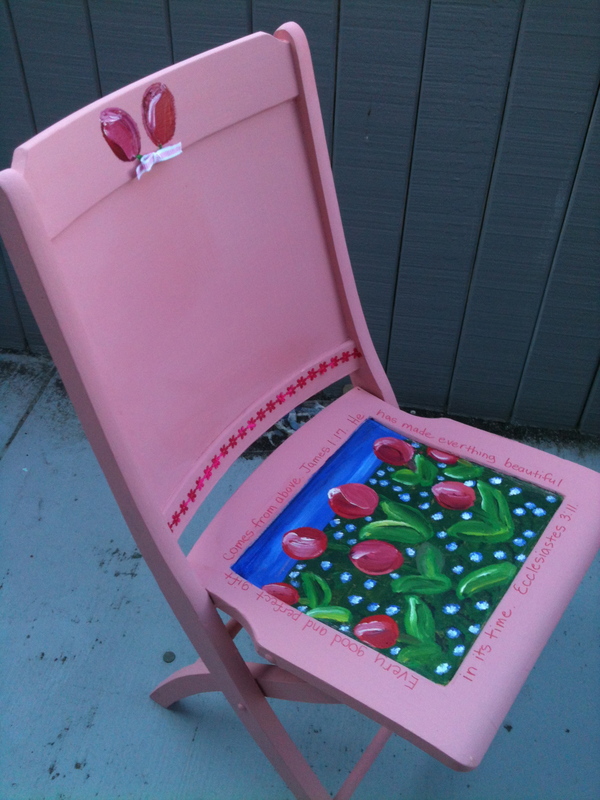 A Chair by Any Other Name….is a Scripture Art Chair! 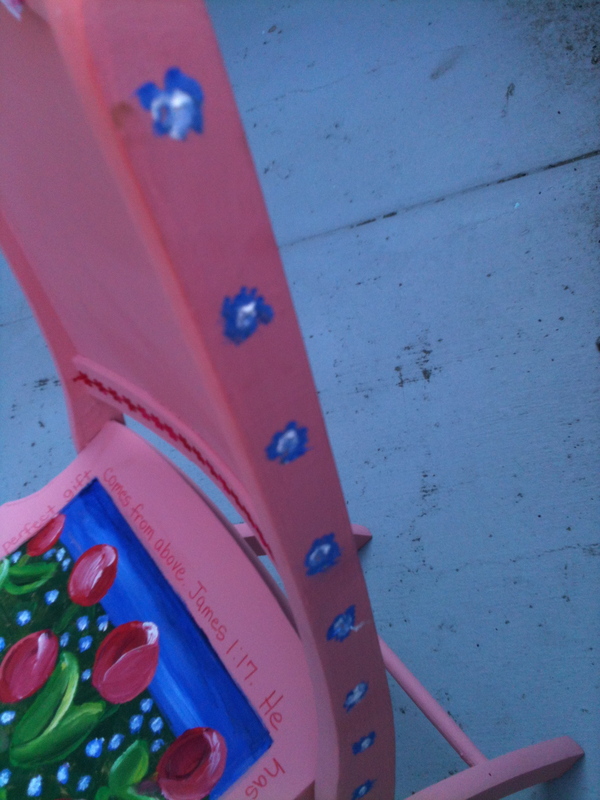 A Chair by any other name….is a Scripture Art Chair! 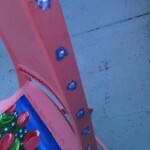 I recently had the pleasure of being asked to donate my artwork by decorating an old theater chair. 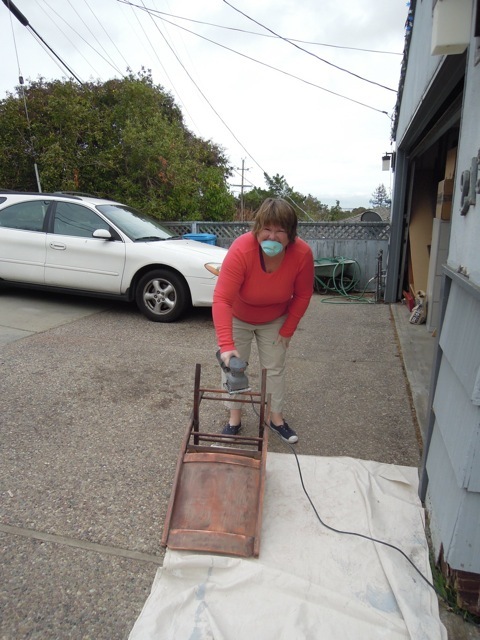 It was to be auctioned off by the Pacific Art League of Palo Alto, a local art gallery. 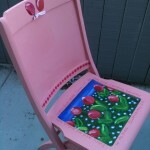 100 artists were selected and given the freedom to use their artistic gifts to decorate a chair as they desired. I received a green light to incorporate my faith as a Christian, which is a rare thing in the art world. Often my Scripture art is turned down at art shows because of the images of the Cross or Scripture, which saddens me. But clearly the Lord was giving me an open door through this project. 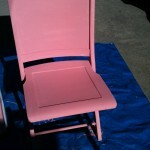 discover the hard work of sanding, priming and painting the chair before we could do our artwork design. 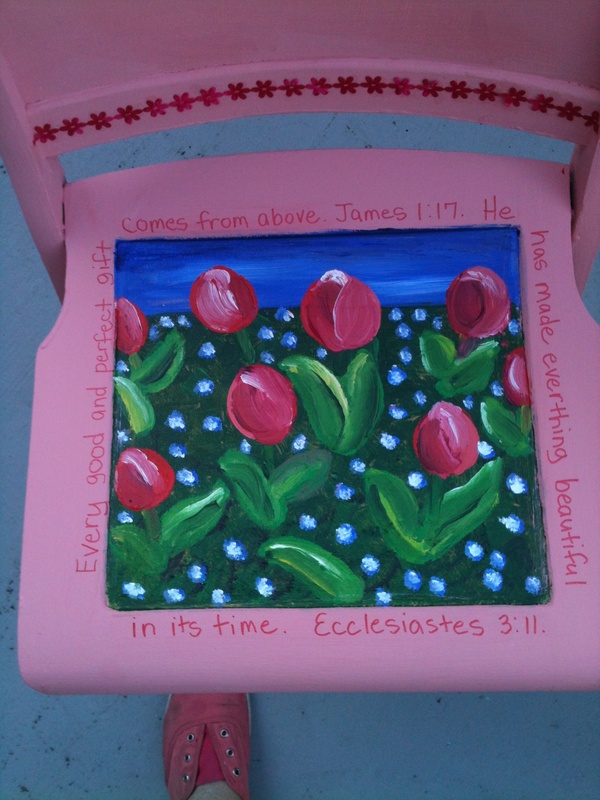 I chose to paint mine a watermelon red with my Scripture painting ‘Red Tulips with Forget Me Nots” on the seat. I added James 1:17 (Every good and perfect gift comes from above) and Ecclesiastes 3:11 (He makes everything beautiful in its time) around the painting. Ribbon was added along with my name, website and signature in gold paint. 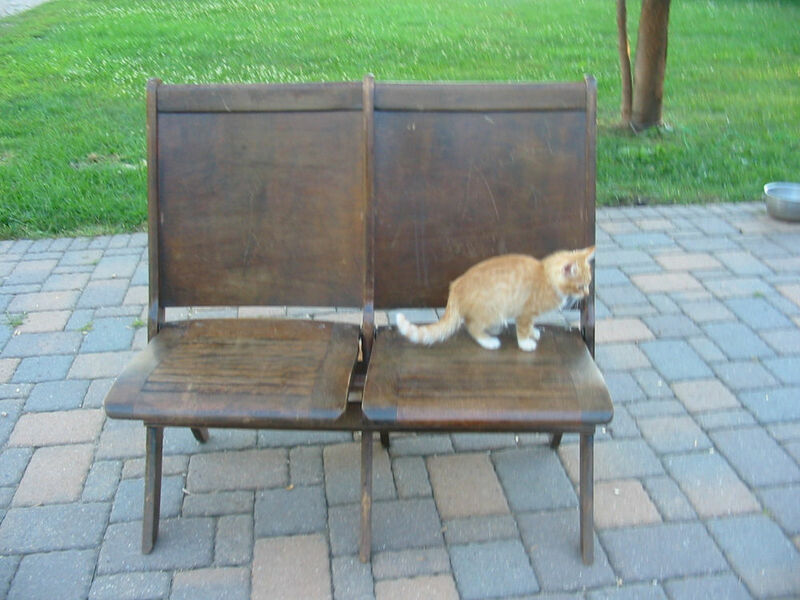 The chairs will be on display at local businesses prior to the auction for publicity. I ask your prayers for mine to draw attention of an art licensor who would like to license my Scripture paintings and greeting cards. My dream. I know God “is able to do immeasurably more than all we ask or imagine” (Ephesians 3:20) so I am excited to see what doors He will open. God has gifted me with this new art venue. 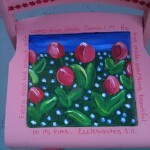 If you are interested in having me paint a Scripture Art Chair(s) for you, please contact me at miriam@giftsofhisglory.com or my website giftsofhisglory.com. 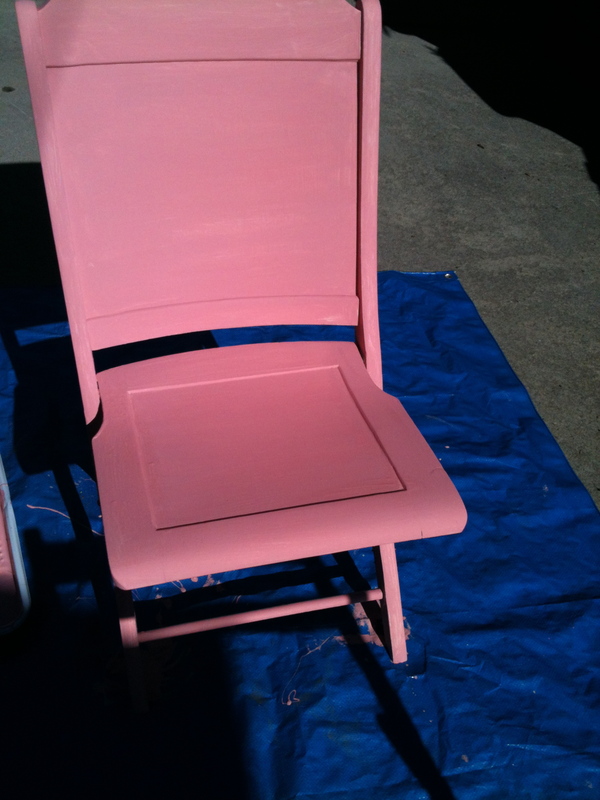 My one stipulation is that the chair be ready to be painted with my artistic decor! To see my paintings and greeting cards, click on ‘my art’ above. Please share this post and help me promote my art ministry by LIKE, TWEET or PINTEREST below. This entry was posted in art, Christian faith and tagged art licensing, art licesor, bible verse art, biblical art, chairs decorated with art, Christian greeting cards, Christian note cards, Christianity, Ecclesiastes 3:11, GIfts of His Glory, God, James 1:17, jesus, miriam sarzotti, Pacific Art League, scripture art paintings by miriam. Bookmark the permalink. 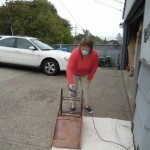 Very cool, Miriam.What a fun project. I’ll be praying for you. thanks Laura for the compliment and for praying for me! I am so ready for a new door to open for my art!